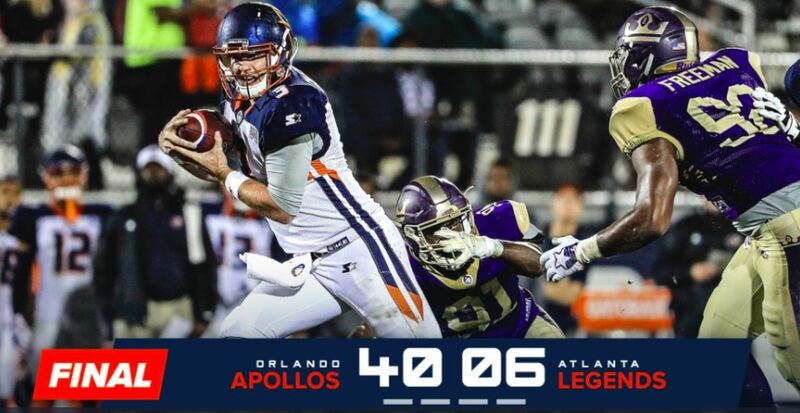 Steve Spurrier back to the sidelines and leads Orlando Apollos to entertaining first win of the inaugural season dominating Legends 40-6. “The guys played very well, they played with a lot of effort,” Spurrier said when discussing the execution of the win. At the beginning, the defense seemed to be a bit disharmonious allowing the Legends to score their first points of the game. Garrett Gilbert states “a little rocky to start, but we kind of got things rolling as the game went on”. The Atlanta Legends got on the boards scoring the first points in AAF history picking up 62 yards on the opening drive, but then the offense stagnated with only getting 63 yards in total over the next two quarters. Gilbert himself scored the first touchdown of his pro career, running the “39 reverse throwback” play pass thrown by Apollo’s wide receiver Jalin Marshall at the Legends 5 yard line. Gilbert completed 15 of 25 pass attempts for 227 yards and three touchdowns. Linebacker Terence Garvin, a former NFL player had an outstanding game. Making history in the AAF with its first-ever pick-six. Later on in the game, he scored a touchdown off his second interception and ran it back for a total of 51 yards. Apollo’s defensive end Ryan Davis Sr. also made history with the first sack of the league. The defensive performance combined did a phenomenal job on holding the Legends to six points throughout the game. Spurrier was pleased with the win and the crowd; the crowd was just over 20,000 for the opening night. He is predicting more fans come the next home game. “Hopefully in two weeks we will maybe have a little bit better weather forecast, and maybe get a few more out”. Apollo’s start off the season 1 and 0 after last night’s win with the final score, Apollo’s, 40 Legends, 6. The Orlando Apollo’s are set to play the San Antonio Commanders next week Feb. 17 game has been scheduled at 4 p.m. at the Alamodome.